DOLLAR CARD MARKETING BUSINESS FOR SALE!! MAKE MONEY BY MAKING MONEY!! 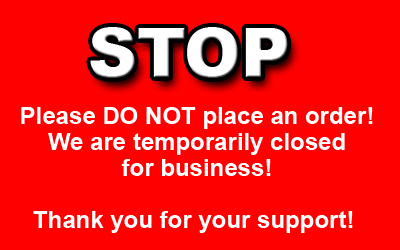 WE HAVE ENJOYED THIS SUCCESSFUL BUSINESS FOR OVER 10 YEARS BUT ARE ALSO MANAGING OTHER SUCCESSFUL BUSINESSES. AS SUCH, WE’RE SPREAD TOO THIN AND NEED TO FOCUS OUR ATTENTION ON OUR YACHT CHARTER BUSINESS. DOLLAR CARD MARKETING HAS BEEN VERY GOOD TO US AND WE REALLY DON’T WANT TO PART WITH IT. BUT WE ALSO KNOW THAT IT NEEDS TO FLOURISH AND OUR CUSTOMER BASE NEEDS TO BE SERVED WITH THE QUALITY PRODUCT WE’VE BEEN PROVIDING FOR OVER A DECADE. IF YOU’RE GENUINELY INTERESTED IN TAKING OVER, FILL OUT OUR CONTACT FORM AND LET US KNOW. PLEASE NOTE: THIS WILL REQUIRE A SUBSTANTIAL INVESTMENT. WITHOUT PUBLISHING A SALE PRICE HERE ONLINE, IF YOU ARE NOT IN A POSITION TO INVEST AT LEAST SIX FIGURES TO PURCHASE THIS BUSINESS, THEN PLEASE DO NOT INQUIRE. POTENTIAL BUYERS MUST BE QUALIFIED. 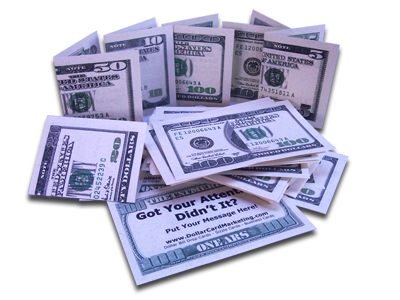 Dollar Card Marketing creates the most realistic dollar bill business cards, drop cards, and sizzle cards in ALL denominations including the $1, 2, 5, 10, 20, 50, and 100 dollar bill for any kind of business, opportunity, or event. Dollar Card Marketing is the only dollar bill business card and drop card company that offers you the most design choices. You can design your own drop cards and business cards using our online editing tool by clicking on “Design Your Own Cards“. Or, you can have one of our professional designers create an effective drop card design for you by clicking on “We’ll Design it For You” (we’ll send you a proof image of your card for your review and approval before processing your order). If you’ve ordered from us previously, we maintain your design in our files and all you have to do is click on “Reorder” and we’ll reprint your last design and get them out to you right away (you can also request changes if needed). Click one of the buttons below to order the most effective offline marketing tool you’ll ever use for your business! of business, event, or opportunity. This video will show you some more samples of our dollar bill business cards, dropcards, and sizzle cards. Although you can create your own dollar bill business cards and drop cards using our online editing tool, these cards were all professionally designed by our own in house designers. You may choose to design your own dropcards using our online editing tool, or we can professionally design them for you! Dollar Card Marketing creates the business cards and drop cards that our competitors can’t! Click on one of the buttons below to order and we’ll prove it!